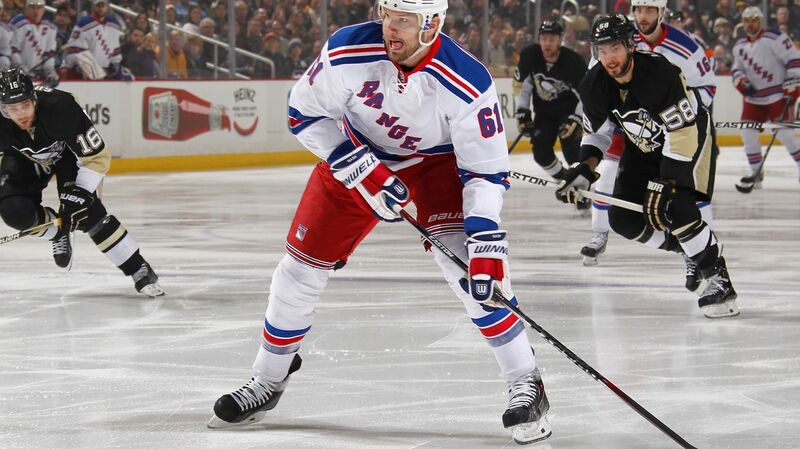 Rick Nash will be a huge focal point for the Rangers as they open the playoffs tonight against the Pittsburgh Penguins on home ice. Photo courtesy of Getty Images. Following a wild opening to the 2015 Stanley Cup Playoffs on Wednesday Night, the Rangers begin their quest for the cup tonight as they take on the Pittsburgh Penguins at MSG in the first game of the Eastern Conference Quarterfinals, round one of the playoffs. This is a rematch of last year’s thrilling series in the second round, where the Rangers found themselves in a 3-1 hole before winning the final three games of the series to advance to the Eastern Conference Finals. But this is a new year, and these are two new teams. The Rangers have been “the hunted” since day one, with people constantly using them as a measuring stick, while the Penguins are trying to embrace the underdog role for the first time in years. For Pittsburgh, the injury concerns are still a big issue for tonight, primarily on defense. Kris Letang has been ruled out for the rest of Pittsburgh’s season with concussion issues, as well as Olli Maata. Christian Erhoff, who missed the last nine regular season games with an upper body injury, practiced but will not play tonight. The rookie Derrick Pouliot is also not available, still nursing an injury of his own. That means that a lot of the workload will be placed on veteran blueliners Rob Scuderi and Paul Martin. Two of Pittsburgh’s call ups will have to play in this game as well. Brian Dumoulin and Scott Harrington are both rookies, with just 14 and 10 games of NHL experience, respectively. Taylor Chorney is perhaps the most experienced, playing in 68 regular season contests over the course of six different seasons. Marc-Andre Fleury is Pittsburgh’s number one guy, and he will get the start in Game 1. Fleury had a solid regular season, holding the Penguins together as they began to slump towards the end of the season. But he has gotten a lot of criticism for his performance in the playoffs, often not able to match his regular season performances. Can he step up in this year’s playoffs? That remains a question mark. While the Penguins have certainly struggled to score goals, with little depth amongst the forwards, their two best players are explosive offensively. Captain Sidney Crosby closed out the regular season with 84 points (28-56-84), providing a lot of the offense for this team. The Rangers did a good job shutting down Crosby last year, allowing him to score just one goal in the playoffs, and they will need to do just that tonight. Evgeni Malkin is perhaps the most likely to take over any given game, but he enters tonight’s game with no goals in his last 10 games. Malkin missed 13 games this season, and may still be playing through an injury now. Despite that, he is still a tremendous player, and will need to be kept in check by New York’s defense. After missing practice for the last two days, it has been confirmed that Kevin Klein will miss the first game of the Playoffs. Klein suffered a broken arm on March 11th against the Washington Capitals, and appearso be close to returning. While this obviously isn’t good news, the blow is lessened by the fact that Matt Hunwick has played extremely well while filling in for injured Rangers. Hunwick will make his first playoff appearance since the 2009-10 season. Matt Hunwick will fill in for Kevin Klein tonight, who is close to returning but not ready, still nursing his broken arm. Photo courtesy of MSG Photos. For the Rangers, Henrik Lundqvist is back in net for his 93rd postseason start, and the ninth playoffs of his career. Lundqvist came back strong from his vascular injury, posting a 5-1-0 record with a 1.99 GAA along with a .933 save percentage in his last six games. He appears to be in top form, and combined with seven weeks of rest, Lundqvist could potentially be extremely sharp in the postseason. Rangers fans will be looking for Rick Nash to start producing for the Rangers again following a playoffs where he scored just three goals in 25 games. A lot of that had to do with injury, but the Rangers missed one of their best goal scorers in the playoffs. Since then, Nash has put that behind him, and had one of the best seasons of his career in 2014-15. Nash probably feels like he wants to redeem himself and help the Rangers more this time around, and should have a big impact in tonight’s game. Heading into the playoffs, the third line of Carl Hagelin, Kevin Hayes, and Martin St. Louis were playing extremely well together. The rookie center Kevin Hayes, capped of an impressive season, finishing with 45 points (17-28-45). The Rangers’ biggest asset last season was rolling four lines effectively in the playoffs, and their third line then was really good. Hayes is entering his first ever NHL playoffs, and will try to guide the third line to success in the postseason. Martin St. Louis, a huge contributor in the playoffs last season, finds himself on a dynamic third line this year, and his veteran leadership will be very important. Photo courtesy of MSG Photos. 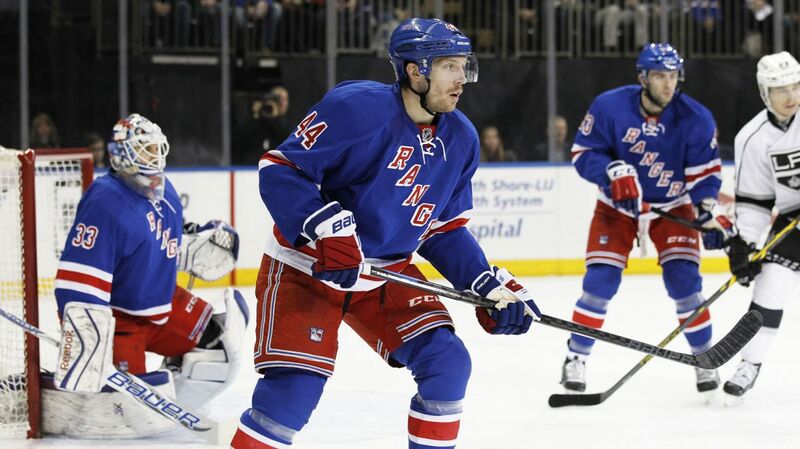 The Rangers and the Penguins will face off at Madison Square Garden at 7 PM. The game will be broadcasted on MSG Network. Posted on April 16, 2015, in Game Previews and tagged Alain Vigneault, Cam Talbot, Carl Hagelin, Chris Kreider, Dan Boyle, Dan Girardi, Derek Stepan, Derick Brassard, Dominic Moore, Evgeni Malkin, Henrik Lundqvist, James Sheppard, Jesper Fast, JT Miller, Keith Yandle, Kevin Hayes, Kevin Klein, King Henrik, Madison Square Garden, Marc Staal, Marc-Andre Fleury, Martin St. Louis, Mats Zuccarello, Matt Hunwick, MSG, MSL, New York Rangers, NHL, NHL 2014-2015 Season, NHL Playoffs, NY Rangers, NYR, Pittsburgh Penguins, Rangers, Rangers Nation, Rangerstown, Rick Nash, Ryan McDonagh, Sidney Crosby, Stanley Cup Playoffs, Tanner Glass, The Ranger Zone. Bookmark the permalink. Leave a comment.